Welcome to the Holiday Inn Monticello Nestled in the foothills of the Blue Ridge Mountains, we are 2 miles from the Historic Downtown Mall . The closest hotel to nearby attractions: Monticello Ash Lawn-Highland and Michie Tavern. A convenient 3 miles from the University of Virginia and the UVa Hospital. Also, minutes away from the numerous arts and entertainment events held at the Paramount Theatre, Downtown Pavilion, Starr Hill Music Hall, Ash-Lawn Opera, and our newest venue, the John Paul Jones Arena also known as &regThe Jack&reg or &regJPJ&reg. For visitors traveling on business we are close to State Farm Regional Office, GE-Fanuc, Hyosung, Lexis Nexis, SNL Securities, Klockner Pentaplast, UVA Medical Center, Martha Jefferson Hospital, , and Luck Stone Corp. Our comfortably appointed rooms feature free high-speed Internet, local phone calls, HBO, pay-per-view movies, irons & boards, hair dryers and coffee makers. The full service restaurant, Charlotte&regs , serves breakfast, dinner and room service daily. 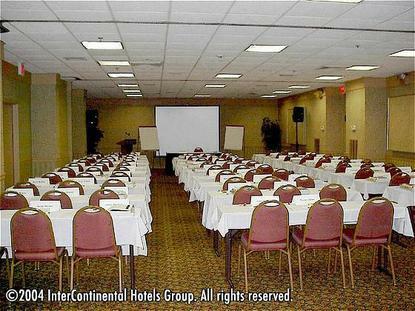 We have over 2200 square feet of versatile meeting and banquet space to host events for business meetings, weddings, reunions , and events . Let our experienced staff focus on the details to assure that your event is a complete success. This hotel is committed to providing accessible facilities under the American Disabilities Act. If your accessibility needs are not met, please contact the Hotel Manager on Duty. Should you require additional information regarding accessible facilities for guests with disabilities, please call 1-800-Holiday (U.S. and Canada) or contact the hotel directly. For the hearing impaired, TDD service is available at 1-800-238-5544 within the U.S. and Canada.